Coaching support in its essence accompanies you through a change process. You're no longer satisfied with where you are, so you take action to reach a new place; physically, emotionally, mentally, spiritually. Depending on your Type preferences, you'll approach change in different ways. You'll have certain needs that have to be met for the change to be successful. You'll be paying attention to certain information and need support with specific areas. These innate preferences might make it hard to understand that not everyone thinks and feels about change the same way you do. If you don't know your Type yet and would like to find out, contact me or find another Master Practitioner in your neighborhood. If you do know your Type, here's a brief excerpt from Introduction to Type® and Coaching, by Sandra Krebs Hirsh and Jane Kise. Use this awareness to prepare for your next change process more effectively, and to provide others with what they need to be on board. I'll be presenting on Type and Coaching at the DFW APT Chapter meeting on March 18th, starting at 6.30 pm at the King of Glory Lutheran Church, 6411 Lyndon B Johnson Freeway, Dallas, TX. If you're in town, I'd love to see you! RSVP here. Next Monday, most of the Western world will probably drink Guinness and kiss people wearing green. Why does St. Patrick get all the credit? He wasn't even Irish! Two of the many Irish people he converted were parents to Brigid. She was friendly with St. Patrick, and took the veil "in her youth" (2). St. Brigid went on to found a convent (the first in Ireland, where she served as Abbess), several monasteries, and an art school. 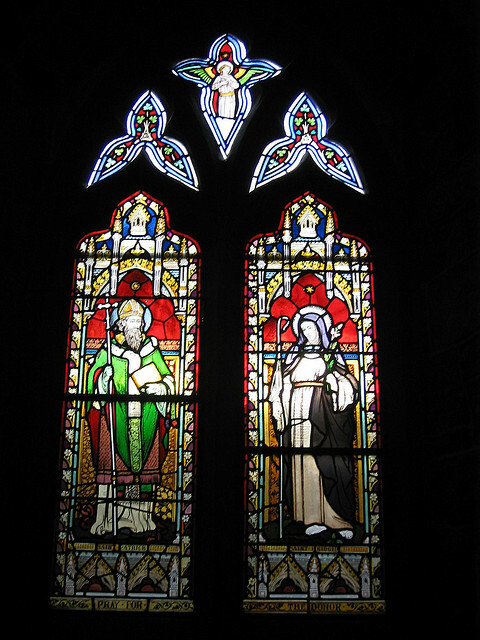 She died on February 1st, 525, and is buried in Downpatrick, together with St. Patrick and St. Columba. Valentine's Day may be over, but I hope you're still feeling loved and connected. Oxytocin is the hormone that is also known as the "love" hormone. Levels in your bloodstream go up when you hug or kiss someone. It increases bonding between mother and child during and after childbirth, and oxytocin receptors are distributed throughout various regions of your brain. Experiments show that people who receive oxytocin e.g. via a nasal spray are more likely to empathize and collaborate with relative strangers (1). What about the different stages of love? Mentalfloss published an article last month going into some detail. For example, when you first fall in love, there's a mixture of dopamine and nerve growth factor coursing through your veins. It's effects have been likened to OCD. The longer the relationship lasts, the more a mixture of serotonin and oxytocin help balance things out into a less obsessive and more stable and trusting kind of love. Since harmony and connection are integral pieces to the extraverted Feeling function, I can't help but wonder if ExFJ and IxFJ personality types show more oxytocin receptors or better connections between the involved brain regions. If you know of any studies, please share them! If you'd like to explore your romantic connection with your partner, or get clearer on what you're looking for in a partner, contact me to learn how knowing your personality type preferences can improve your relationships. Entrepreneurs are at risk for depression when they over-identify their self-worth with the success of their business. Practice the art of non-attachment: do your best, give it your all, and don't be hung up on the result. Engage with a multi-generational community. Learn from one another, and realize you don't have to do it all alone. Adopt the notion of practice. "Practice being a CEO." Allow yourself to *be* (yourself) at work. Jerry Colonna, executive coach and former venture capitalist, interviews Parker J Palmer, author, educator, and activist, about "Surviving the StartUp Life". They discuss "standing in the tragic gap" - the place between harsh realities of life and knowing what could be possible; aka the "eternal human yearning to be connected with something larger than my own ego". Life in a startup (anywhere, really) is hectic, and it's easy to forget self-care. Unfortunately, our bodies and minds are more likely to break down when under prolonged stress. Clinical depression becomes a real issue. He is not surprised when he hears someone under depression commits suicide. Clinical depression is utterly exhausting, and eventually you just want a rest. In depression, each of these are rendered utterly useless. Intellect: You can think yourself into a depression, but you can't think your way out of it. Emotions: A depression is not about feeling bad, it's the terrifying knowledge that you can feel nothing at all. Will: It barely exists. At the advice of a therapist, he kept track of any minor gains he made every day. He learned something about using a gentler metric because his will was non-existent. Ego: While living in ego is lonely, a depression will shatter even that. What he came to see is that he has another faculty, the Soul. He learned to honor his being and how to hold the other faculties more modestly. They were no longer the main tools. Nowadays, his intention is to be in the world in a more soulful, authentic, truthful, way. He is honoring his potential and his limitations. At 74, he feels it more important to be in the world as he truly is. The video continues with a Q&A with the audience. Here's an excerpt. What is the one thing that stops entrepreneurs from being successful? (Jerry) The fear of failure. First, be sure you know how you define success. There's so much pressure, but if you apply the notion of practice to the startup and you find a way to pay the bills, then the definition of success starts to change. Take the fangs away from the monster of fear and failure. How can I hold myself together in the multiple roles I play? What if I succeed as an entrepreneur but fail as a father? (Parker) Community has healing power. When I struggled with depression there was one phrase I needed to hear: "Welcome to the human race; we're all in this together." This experience doesn't set you apart, it pulls you closer to us. The failure or the success don't define you; they're both equally toxic. We're often taught to play different roles and segmenting our lives, but we do have control over whether we're the same person everywhere we show up. As we do it, we incrementally add to our own sense of well-being and wholeness. (Jerry) I went to watch a movie with my son, and was moved to tears. A part of me said, "I can't do this in front of him" - I was afraid he would love me less. But what he expressly said was, "Dad, it makes it easier to love you, knowing that you struggle." It's ok to share your struggles with your family and kids, because you'll be modeling the wholeness of who you are. If you can't see it, the link is https://www.youtube.com/watch?v=qlSp16ZhiXg. The violence that happens at work can be a harsh word (self-talk or said out loud), not taking a lunch break (denying yourself basic nourishment), withholding information, feeling resentful (envy and greed both have green eyes), sabotaging yourself or others. I invite you this week to be kind to yourself, and to recognize your (or, if you are) suffering. A popular origin story for this day of friends and lovers is that Valentinus went to prison for marrying soldiers and tending to persecuted Christians in Rome. It became the romantic feast of chocolates, flowers, and jewels not through Hallmark, but with the help of poets like Chaucer in the 14th century. If you're a teacher with a diverse class, make sure providing hearts or cards for all other children is optional, as parents with a Muslim faith may have objections. I hope you take this day to appreciate and love yourself, as well as your friends or partners. It's true, American schmalz has largely taken over and most of your stores will have at least one pink and red aisle right now. The British Empire included Canada, India, Australia, New Zealand, South Africa, the Sudan, and other African countries at the time, so it's no wonder it's widespread and celebrated. Australia, New Zealand, France, Germany, Holland, Belgium, Italy, and mainland Spain celebrate Valentine's same as most Anglo-Western cultures, with the exception of Cataluña - here it's on Sant Jordi (April 23rd) where boys give girls a rose, and girls give boys a book. In India, different states and different religions have different customs. Many celebrate Spring Goddesses around early February, and traditionalists see Western Valentine's as yet another commercialized event. Estonia and Finland call it "Friend's Day", so getting a rose doesn't mean he loves you. The Greek have another Saint to protect lovers, Hyacinth of Caesarea, and she's celebrated on July 3rd. In Spanish-speaking South America it's a hybrid día del amor y de la amistad (day of love and friendship), so nobody has to feel lonely. Guatemala calls it día del cariño (affection day). In Brazil and Portugal, it's dia dos namorados (day for lovers / those who are in love). The Philippines and Sweden call it heart's day or all heart's day. It's the busiest day for florists. South Korea and Japan have joined the feast in the 20th century. Japanese boys give dark chocolate to the girls they like on February 14th, and the girls reciprocate with white chocolate on March 14th. Days and chocolates are reversed in South Korea. How are you going to celebrate this year? Scientific evidence is piling up that we’re indeed social animals. No matter what your personality type, your brain will light up when you feel like you don’t fit in, or when you’re being excluded. In international settings, this social pain is often called “culture shock”. Those feelings of exclusion and different-ness activate the same neurons that fire when you break your foot and experience physical pain. What does this mean when you’re in a new country? For international teams, that means work may get sabotaged, because crucial information might not be shared. At any rate, your (and their) brain will be flooded with stress hormones like cortisol, which limits your ability for creative problem-solving and optimistic future-planning. No, you don’t have to start romantic relationships with all the locals. But you should try and find things you have in common with your new colleagues and neighbors. You should try and understand their culture and learn that there’s nothing to be afraid of. Teach them about your culture without trying to impose it. Your brain can learn; the more you expose it to the new culture, the more it will get used to it by rewiring existing connections and creating brain-maps (representations of the new terrain) for easy access. You can teach your brain to recognize strange-looking faces, street signs, or produce labels as something you can handle. Know someone who could use some help? If you’re finding yourself a little more depressed than usual, you might be experiencing culture shock. If the partner you relocated with isn’t sleeping well and has a shorter fuse than usual, they might be experiencing culture shock. If your team isn’t working effectively together, they might be experiencing uncertainty of how to deal with the different cultures within in the team. You can snap out of social pain or culture shock about as easily as you can mend your broken foot by willing it stop hurting. Healing takes time, and support can help. Contact me to see if working together might help you to come up with strategies of how to re-wire your brain faster.